A Work Devoted to the Moral, Religious, and Political State of Mankind; In which Will be Shewn the Progress of Spiritual Truth / Shewing the Fall of the Great Organization with its Medium through His Disobedience to the Divine Commands Given unto Him, Also Showing How in Divine Revelation, He had Foretold His Own Fall with the Fall of the Cause of which He was the Leader Appointed by Heaven to Lead it on to the End, and Prepare the People for the Establishment of the Church of Christ. Nottingham, England. Editor: Thomas Cox Stretton. 1/1, August 9, 1862-1/14, August 22, 1863. 2-8 pp., 9 pence an issue. Stretton was a lay Baptist preacher and a lace-maker when he encountered J.G.H. Brown and became the leader of one of the Twelve Tribes of the Brown's Great Organization. He started this journal in 1862 when he broke with Brown and assumed the mantle of "chief Ruler of the Church of Christ," as he was named by the Angel Gabriel, in contradistinction to Brown who had been a mere prophet and head of the Great Organization. He had come to realize, he said, that Brown had pilfered some of the money the Great Organization had raised to print its "new, correct, and complete Bible" ("A Message from God") that had been dictated by the highest and holiest angel. Brown's perfidy was confirmed to Stretton by the Angel Gabriel himself in June 1862, when he revealed that much of Brown's revelation was from his own imagination: "I, Gabriel, declare unto thee, that the Revelations alluded to were partially the Medium's own imagination, and spiritual impression combined, for the purpose of bringing to light his fraud and duplicity...." Stretton was an entranced seer but was generally unsuccessful himself at seeing in the crystal and claimed to communicate directly with the guardian angels, although the angels provided him extensive details on scrying for the members of the church. 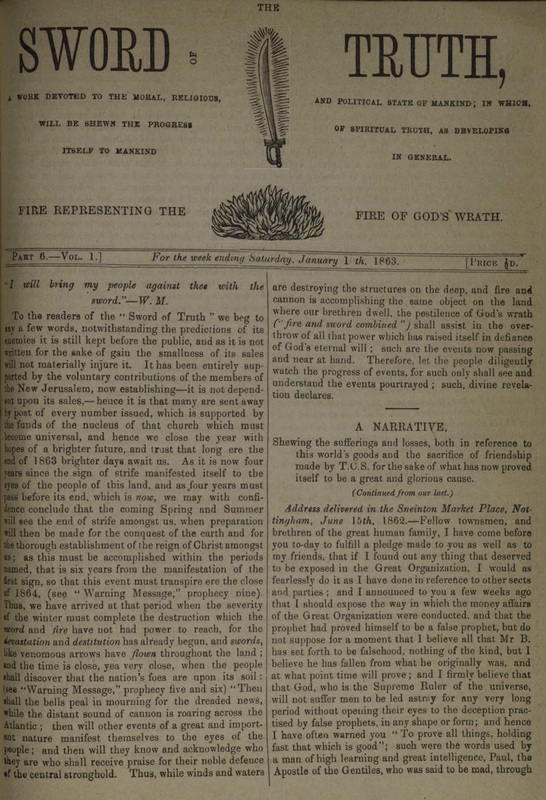 The last issue of the journal announced the proximate appearance of a second volume, to be called Fount of Truth, to commence when the debts for Sword of Truth had been paid. The notice opined that the new journal would be more interesting since it would concern itself more with revelations than with the interminable details of Brown's peculations, but there is no indication that the debts were paid or that the new journal ever appeared, and Stretton's Universal Church of Christ faded into obscurity, though it was still holding meetings as late as 1870 when it was noted in "Spiritualism in Nottingham," Medium and Daybreak, July 1, 1870. University of Rochester.